How do these definitions fit into improving your score on the golf course? In short, they mean you should improve how and what you think about prior to a shot and make shot selections that give you the highest percentage for success. When managing your golf game, the term “self-fulfilling prophecy” can and will affect the outcome of your shot. When playing golf, your mind doesn’t interpret your thoughts of “good or bad” or “do or don’t”; however, it does interpret your thoughts of left, right, water, out-of-bounds, etc. The best thing you can do to improve your score is to eliminate the word don’t before making a stroke. When your last thought before making your stroke from the tee is “Don’t go left,” that’s usually where the ball will go because your mind, which controls your swing, understands left. If you want the ball to go to the right you need only to think “go right” and it usually will go to the right. The point is that positive thoughts will help you keep the ball in play, which leads to a better score. I was working with a university student who had hooked his drive into a hazard on the left side of a par 4 hole. The fairway was wide and there was more open room for a miss to the right of the fairway. Before his shot, we had discussed a plan for the best outcome for his tee shot. After his shot went into the hazard, I asked him what his thought was prior to making his swing. He said, “Don’t go left.” His shot to the left was a self-fulfilling prophecy. Our brains work so quickly that there is no time to change our swing after we have put it in motion. This is due to what is known as open-loop control. The golf swing takes about one second to complete — it’s done before your muscles can stop the swing. So, when the last thought you had was about going left, that’s where the ball will go. In the diagram above, the eye represents your senses, vision, touch, hearing, and kinesthetic sense (basically the feelings in joints and muscles). 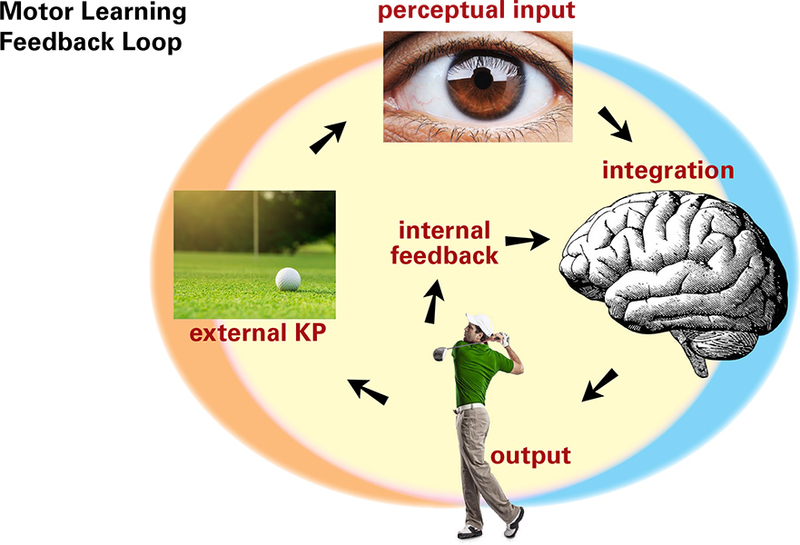 Internal feedback comes from within your body, external KP is “knowledge of performance” that lets you know where the ball went and how well or poorly you hit it, and integration is what your brain does with this information so you can think about it after the swing has been completed. In about one and a half seconds you see the club head when addressing the ball, feel your muscles tighten in your body as you make your backswing and downswing, and hear the contact of the club head to the ball. If you have selected the best shot and you execute it correctly, you will have a good result. Two types of errors plague athletes, especially golfers: errors of selection and errors of execution. You can choose the correct shot but mis-hit it. That’s an execution error. Or you can choose the incorrect shot — a selection error. Sport psychologists will tell you to keep your thoughts positive prior to hitting the ball by thinking about or visualizing the ball following your intended line and ending up where you want it to finish. Although positive thoughts are best, too many times golfers make the wrong choice when managing their game — a shot selection error — and no amount of positive thinking will help. For example, you may have a positive thought about hitting under some branches to reach a green in regulation (Photo 1). Usually, with a low percentage shot like this, your ball hits the branches and stays in the rough. This was poor course management by making a shot selection error. Good course management tells you that the better selection would have been to chip the ball into the fairway and then hit the ball to the green. 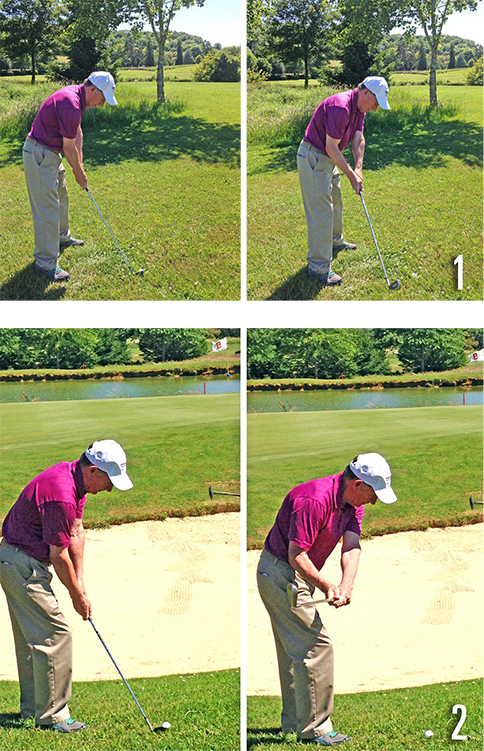 The same type of poor course management comes when you are short sided next to a green in behind a bunker (Photo 2). Too often golfers try to be “too cute,” another selection error, to get the ball close to the hole and they leave it short of the green. The good miss would be to fly the ball onto the green so it has a chance of staying on the green or rolling into the fringe so you can putt rather than having to make another pitch shot out from the grass or the bunker. Good course management is executing the high percentage shot not the high risk shot. So, remove the word “don’t” from your golf vocabulary, think of where the shot should go, and select the shot that will give you the highest odds of successfully executing the shot so you can save par or make a bogey. These changes will lower your score. Dr. Nelson Neal is the head coach of boy’s golf at Lakeridge High School in Lake Oswego, Oregon. He was the assistant golf coach at Marywood University, Scranton, Pennsylvania. Dr. Neal was a Professor and taught university students who were studying to be Physical Education teachers and coaches.